I built this lathe stand for my new midi lathe. I designed it to have minimal horizontal surfaces so that it would not collect a lot of shavings. Note: The Sketchup design shows the toolbar at a canted angle, but I ultimately decided to just keep the tools vertical because I didn’t want the handles banging into my legs. Also, the Sketchup design calls for floating tenons to be used in the base angled joints, but I ended up making keyed miter joints instead. looks very strong with an unusual design… i just dont know if the legs are gonna be in the way… but a great job you did on those joints !!! I had to beef up the design a bit because this one is made of wood. Good looking stand. Looks like you could make the legs hollow and fill with sand. Can you reach the tools without stooping? The legs are only 4” x 4” so I am not sure that hollowing and adding sand would gain much. However, what I did do was add a small amount of silicone under each pad (there are six) which adheres the stand solidly to the floor but can easily be moved if needed by cutting through the silicone with a thin blade. It is a semi permanent solution. As far as stooping, the tools are fairly long and my fingers reach the top of the tool handles without bending over. I was more concerned about the tools having sufficient clearance when inserting and extracting from the tool bar. Notice the motor nestled under the lathe bed. Having said that, the tool bar could probably be raised slightly and still have good clearance. I added my Sketchup design of the lathe stand in the project summary above if you want to see the design in more detail. I get annoyed when I want to place my foot directly under my lathe and the 4×4 bench leg is in my way. Have to believe with the way these legs jet out that you will constantly be maneuvering around them. Or kicking them…......or stepping on them….....or tripping over them…...etc. Your observation is noted and I will be keeping a close eye on how I adjust to this design. I did a lot of trial-and-error with the leg design and I don’t anticipate any problems with maneuvering around them. Maneuverability is the primary reason I spread the legs out in the first place as opposed to keeping them perpendicular to the lathe bed which many designs do. 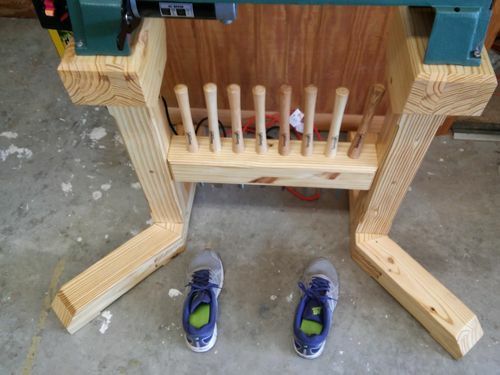 The worst case is I will probably set my left foot on the left leg base while I turn the wood. Besides, I generally don’t move side-to-side very much while I am turning and this lathe is only 18” between centers. The first woodworking tool I had as a kid was a full size lathe. I had the lathe mounted on a large flat workbench along with some other tools and a small storage cabinet of my father’s. Needless to say, I had a huge mess to clean up every time I used the lathe. I was seeking something different with this lathe stand design. Very professional, sofisticated and skilled work on this stand. Joinery is absolutely phenomenal. Not silly at all. I put a bevel on the sides of the toolbar to decrease horizontal space. The toolbar still catches a few shavings but there is easy access with the shopvac. That looks extremely nice, well done.